The Northeast Wisconsin Chapter of Safari Club International and The Northeast Wisconsin Chapter of SCIF Sables participate in numerous local conservation, educational and humanitarian project every year. With out the help of our donors, volunteers and event attendees we could not make this happen. We were able to send 3 area teacher to the American Wilderness Leadership School in Wyoming. We also were able to add funding to the Thomas “Zoom” Zimmer Memorial Scholarship - An endowed scholarship for student attending the UW Stevens Point Collage of Natural Resources. Berlin Conservation Club - Help fund various conservation and youth projects. Smith's Pheasant Crest recieved funding for their Annual Pheasant Hunt for disabled hunters. 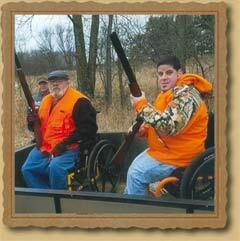 "Challenge The Outdoors" received funding for their Spring Pheasant Hunt for disabled hunters. J&H Game Farm - Help fund their Annual Youth and Ladies Day. "Triple ‘O’ Outfitters Wounded Warrior Hunt" - With the help of owner Rob Denney and board member Otto Reetz we were able to take a Vet on a spring Black Bear Hunt in Idaho. The DJT Lobbying, a lobbying group in Madison, WI received funding to work on protecting our hunting rights right here in Wisconsin. For a more in depth information check out our Project Funding Report. Jim Slezak at 920-739-0840 or email bejapote06@yahoo.com.